William “Will” Hernandez (born September 2, 1995) is an American football guard for the New York Giants of the National Football League. He played college football at UTEP. After redshirting his first year at UTEP in 2013, Hernandez started all 49 games from 2014 to 2017. After the 2016 season, Hernandez was a second-team All-American. After the 2017 season, Hernandez was named to the C-USA first-team. He was also invited to the College Football All-Star Challenge. The New York Giants selected Hernandez in the second round (34th overall) of the 2018 NFL Draft. 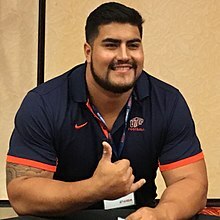 Hernandez was the second guard drafted in 2018, behind Notre Dame's Quenton Nelson (sixth overall). Jones: "Hernandez will be an instant starter"
On May 12, 2018, the New York Giants signed Hernandez to a four-year, $7.45 million contract that includes $5.08 million guaranteed and a signing bonus of $3.49 million. Hernandez was named the Giants starting left guard to start 2018, starting all 16 games and was named to the PFWA All-Rookie Team. ^ "Will Hernandez on Pro-Football-Reference". rbref.com. Retrieved August 28, 2018. ^ Bret Bloomquist. "UTEP lands two on All-America football team". El Paso Times. ^ "Will Hernandez set to compete at All-Star Football Challenge". kvia.com. ^ "Texas-El Paso OG Will Hernandez : 2018 NFL Draft Scout Player Profile". NFLDraftScout.com. Retrieved May 12, 2018. ^ Wesseling, Chris (April 27, 2018). "Giants select Will Hernandez with No. 34 overall pick". NFL.com. ^ "Spotrac.com: Will Hernandez contract". Spotrac.com. Retrieved September 17, 2018.